Maryland was once the home of a well-respected horse racing industry. In recent years (and by recent, I mean during my lifetime - the past 20-something years), the purses have diminished to a pittance leading many serious owners to pursue out-of-state races just to stay in the black. But with a vice-tight grip, Maryland has managed to hold on to one last "jewel" - The Preakness Stakes, otherwise known as the second race of the Triple Crown. Preakness, the second oldest leg of the triple crown, has been held at Pimlico Race Track since its inception in 1873 and is named in honor of the first horse to win a race at the track when it opened 3 years earlier. Pimlico Race Track, once in a decent area of Baltimore City, is now surrounded by one of Baltimore's less-than-idyllic neighborhoods thanks to a rise in crime over the past (eh, this is a guess) 20 years. Preakness generates around $40 million dollars for Baltimore City and Maryland each year. Typically, Preakness is viewed from 3 vantage points - The Grandstand/ Clubhouse (nice and pricey), Private Tents (again, nice and pricey), and The Infield (Animal House on steroids). In 2006, I went to Preakness (infield) with a group of friends (it was BYOB at the time). People were sloppy drunk, racing across the tops of in-line portable toilets (yes, you read that right - if you don't believe me, YouTube it), and doing lots of other things I'd rather not recall with any clarity. Suffice it to say, I got separated from my friends on the way back to the car (which was parked on someone's front lawn for the bargain price of $40) and my cooler full of Natty Boh was taken out of my hands by four white guys who could have started for the University of Alabama football team. Oh and my cell phone had run out of juice. Bonus. 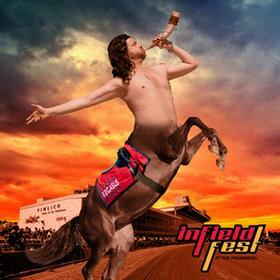 In 2010, The Maryland Jockey Club decided to use a bold marketing slogan and infield musical acts to attract the younger generations back to the infield for a day of excessive drinking and betting - "Get Your Preak On" was born. First of all - as anyone with a semi-decent education (or a love of Harry Potter) can tell you, a half-man, half-horse creature is a centaur - not a Pegasus (horse with wings). Presumably, the "Kegtaur" was entirely too complicated for the masses and just not as catchy. Secondly, "Kegasus Lord of the Infield"? Are they trying to draw the World of Warcraft geeks from their computers for an afternoon at the track? Forget about the cries from parent groups that this new mascot will encourage binge drinking because all-day drinking has been a part of Preakness since its inception albeit probably started out as well-dressed, upper-crust types sampling bourbon from flasks all day long. You could even say it's tradition. Forget about the fact that someone was actually paid to come up with this mascot (if I knew it was that easy, I would have gone into marketing!) and that someone (who obviously hasn't seen the inside of a gym in a while) was paid to pose for the likeness of this Kegasus. This is a desperate attempt to appeal to the basest crowds in Baltimore - in other words, with an invitation like that, who do you think is going to show up? Congratulations, Maryland Jockey Club. In a state whose racing industry is already on the ropes, you're working to ensure that any remaining dignity of our 138- year old "jewel" is traded for short-term additions to your coffers.